This is Sharpless 119 (Sh2-119), a nice an often forgotten emission nebula sitting right next to the North America Nebula – somewhere in the Pacific Ocean. Probably, this is why are there not many images of it. In addition to the dominant H-alpha emission there are some prominent dark dust lanes. 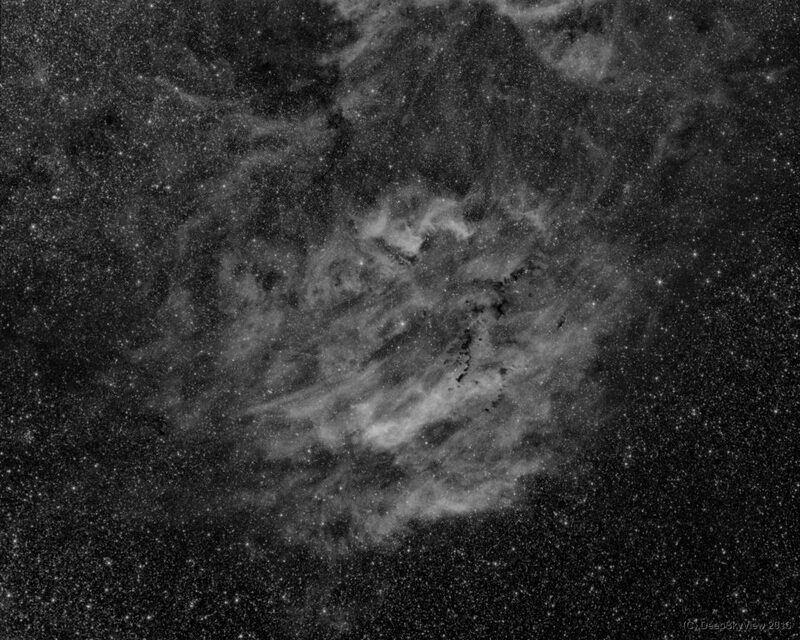 In the center of the nebulosity there is the star 68 Cyg. This is a straight Ha monochrome image constructed from 20 exposures with 600 sec each, more than 3 hours of total exposure. Taken with my wide-field setup with the Asahi/Pentax Takumar 135mm f/2.5 with the ATIK 460EXm from my balcony in the light-polluted Frankfurt area – Bortle class 7 (red zone). Make sure to look at this image in full-size view.